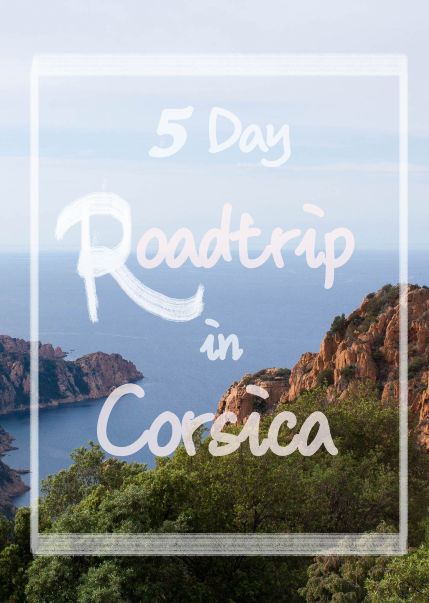 It was during our Summer holidays that my friends and I decided to go on a road-trip in Corsica. None of us had seen the island before, but we had family who had been there, and said very good things about L’Ile de Beauté (the Island of Beauty), as we call it in French. And November seemed to be the perfect time to go there: we were planning on the absence of tourists to soak up the last sun rays of 2017 before Winter comes and make the most of Corsica. Spoiler: we were right, and Autumn is definitely a great time to visit the Island. Yet, maybe coming before Day Light Saving time would be wiser, as the days were very short, and we had a very hard time squeezing all the things we wanted to do in 5 days of less than 7 hours..
Our plane landed on Nov. 1st in the morning in Bastia, where we had booked a car. From there, we were going to Ajaccio, where our AirBnB was booked. The shortest way was to take the T20 (it is a 2h50 drive) and Corte is almost in the middle. We thus decided to make Corte the first stop of our road-trip in Corsica and grab lunch there. 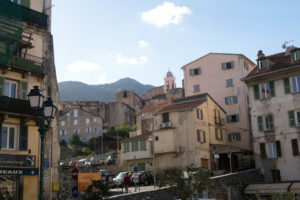 The old town is perched on a rocky peak, and was the capital city of Corsica in the middle of eighteenth century. 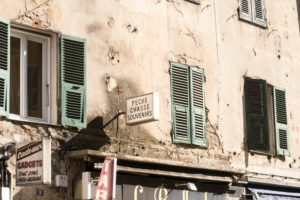 Whereas Napoleon is the ‘star’ of Corsica, it is after Pascal Paoli, a native from Corte, the founder of the University of Corte, and the instigator of the Corsican Constitution of 1755, that many streets of Corte are being named. Just outside of Corte is the natural site of the Vallée de la Restonica (Restonica valley). After having lunch in Corte (addresses listed below), we hopped in the car, drove a few kilometers, until we were stopped by a group of cows standing in the middle of the road. We parked on the side of the road, took pictures of them (of course), and went for a walk along the stream. If you stop at the Point d’Information, as we did, you can take a nice walk by the natural pools. It is also possible to go on a longer hike (up to 5h for some of them): in that case, you have to drive up to a sheep fold and dedicated parking area. 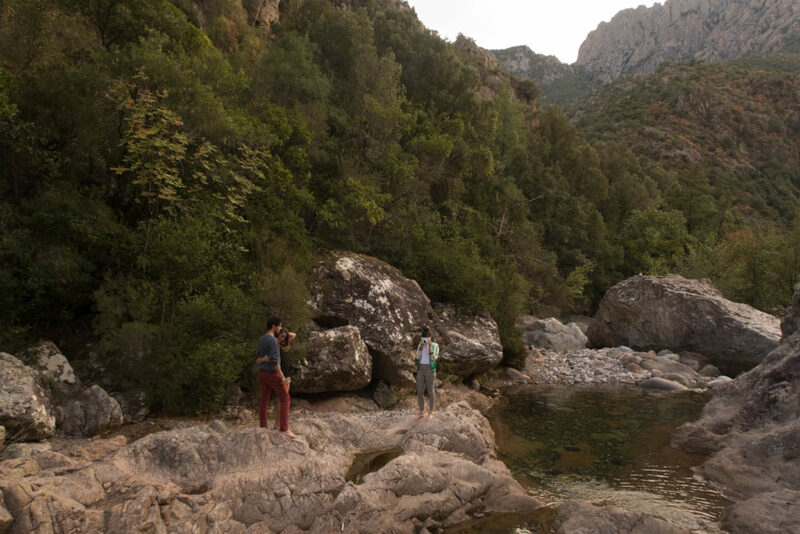 We did not encounter any difficulty to find a spot to park, as we were in Corsica during the low-season, but it get packed very quickly during the summer. 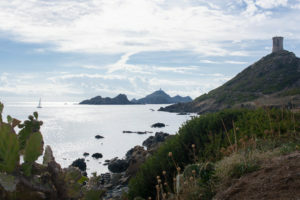 On our second day, we went to les Iles Sanguinaires and la Pointe de la Parata, a nice landmark in the outskirts of Ajaccio. It is possible to take the boat to tour the islands, but we decided to go by foot and climb up to the observation tower. From there, the view of Ajaccio and its golf was incredible. The next day, we paid a visit to the Coti-Chiavari prison, which, according to sources on the internet, is haunted. I did not know that when I went to see it ^^. It probably got its reputation from the fact that in the 18th century, inmates contracted malaria..
From there, we enjoyed the view of the Ajaccio, and explored a bit the eucalyptus forest. Indeed, because of the prevalence of malaria, eucalyptus trees were brought to the island in the 19th century, as it was expected that they would draining the swamps. After picnicing in the forest (it felt a bit like we were in a wild rainforest)(and yes, we spent a lot of time eating), we headed to Mare é Sole beach. On November 4th, we drove one and half hour on meandering roads, to go hike on the Calanques de Piana. As it was only us and a family on the trail, we felt like we were the last Mohicans on Earth. On the edge of the cliff, it was almost like we were sky-diving. From Piana, we drove a few more kilometers to the Gorges de la Spelunca. The Spelunca (which means ‘den’) is a nice path between natural pools, Genoese bridges from the 18th century, and pines. 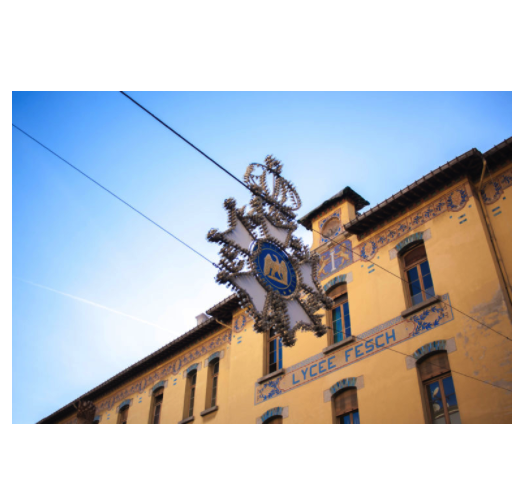 – La Rivière des Vins: This traditional restaurant was the one recommended by our travel guide, and is well-known for its grills and meats cooked on wood fire. Unfortunately (or fortunately, as we discovered La Trattoria! ), they were not accepting guests anymore when we arrived. The restaurant is also closed on Sundays, and we could not try it on our way back to Bastia. – 20123: This restaurant is listed in many travel guides, and was also recommended by the physiotherapist my friend had to see in emergency! 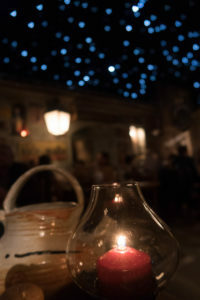 They serve traditional and ‘familial’ Corsican dishes. 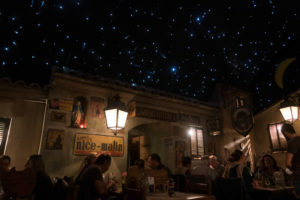 I really love the setting, making you feel like you are dining in a village street under a starry night. Yet, I have mixed fillings about the food: because there are several courses, you get to taste a bit of everything. On the other hand, we found like there was too much to eat, and were almost rolling off our chairs by the time we were done. Going to the ATM to withdraw money as they were not taking our credit cards -even though we had a 200+ bill!- was a struggle. At least, the waiter know we could not run away without paying! Given the fact that we were only in Corsica for five days, that one of our friend is car-sick, and that there are many things to see around Ajaccio, we chose to stay in there. So our « road-trip in Corsica », was technically not road-trip, but oh well… We would really recommend the AirBnB we stayed at in Ajaccio: our host Claude was particularly nice and helpful, the apartment is well-located, and well-decorated. So we had an impromptu photoshoot sessions, where we pretended to be famous lifestyle bloggers (oh well, again^^). Empires was listed as a must-see in our travel guide, and I recommended it as well. This cute boutique in the city center sells only Napoleon-themed artsy items -be it pins, postcards, posters, bags, hairbands! Their collection is fun and cute at the same time, and we had a good time ferreting out some souvenirs. I would have loved to visit Bonifacio, as the photos I had seen are incredible. And so is the history of that city. Yet, we did not have much time on the island, and did not want to leave our car-sick friend behind (as she would not have been able to handle a 3-hour-long drive from Ajaccio to Bonifacio). Besides, even though we landed in Bastia and started/ended our trip in the North, we didn’t get the chance to properly visit Bastia or the northern part of the Island (Ile Rousse, and le Désert des Agriates for instance!). Therefore, for a next trip (or a first trip to Corsica), I would rather divide our time between the North/Center of Corsica, and the South of the Island. Booking at least 2 places and planning ‘real’ stops could be more convenient -but also requires more planning ahead, and less flexibility when traveling. Is Corsica really France? Hum tricky one! Legally yes! However, Corsican people consider themselves as Corsicans and not French people. As a matter of fact, there is a sort-of-guerilla movement that was created in 1976, the FNLC -the National Liberation Front of Corsica- that performed several bomb attacks in the 1980s and 1990s. Since the 2000s, most of their attacks targeted buildings and infrastructures, especially those owned by ‘mainland French’. They also voiced their opposition to ISIS and their implication in the anti-terror war against Daesh in July 2017! A French movie from 2004, L’Enquête Corse, with Jean Reno and Christian Clavier, depicts with humour the topics of the bombings committed in Corsica, police wars, and Corsicans’ pride. (and we watched it for fun during our stay!). Using credit card? Not always possible! When we went to 20123 (cf. supra), we had to go to the nearest ATM to pay our 250+ bill! At first, we thought the waiter was joking, but turns out he was not. We could totally have run away and not pay our meal -except that we could not run because we were so full^^. So my advise: always have cash on you, and ask beforehand if they accept credit card payment. Are Corsican people rude? That’s another cliché about people from Corsica -but I would not confirm it. Maybe because we did not go to Corsica during the high season, people were on the average as kind as any French people (okay, that’s maybe not super kind either, but not terrible at least). Our host was really helpful, and one of my friend who suffered from severe back-pain (that’s karma, for trying to throw me into the sea!) went to see a physiotherapist who was super nice and gave him a list of places to visit, and restaurants to go to (including the one aforementioned, where credit cards are not accepted). 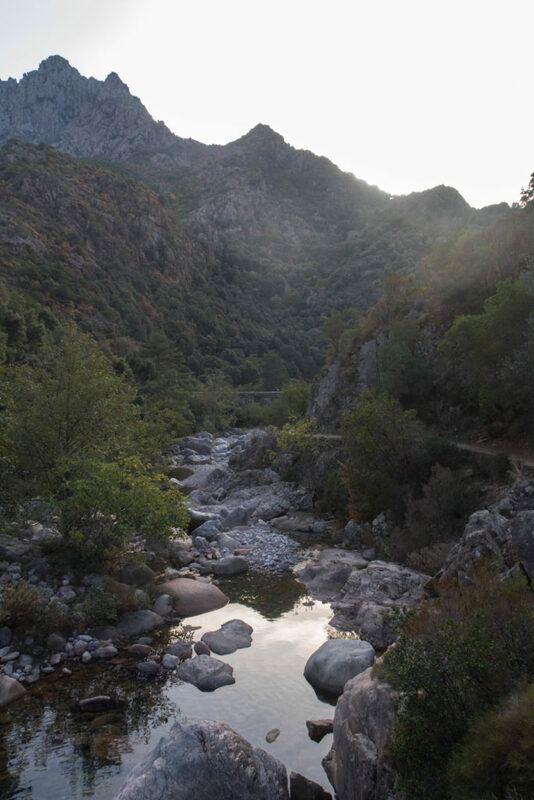 More photos of our road-trip in Corsica here! Alternative itinerary for a 1-week-long road-trip (Bastia-Corte-Chisa-Porto Vecchio-Bonifacio) on the blog of Place With A View [FR]. Each stop is also being dedicated its own article. I especially like the one about the Restonica Valley. Alternative itinerary for a 12-day-long roadtrip in a S shape (most complete itinerary in my opinion) and other general information about travelling to Corsica on the blog of FrenchyDuty [ENG]. There are also several articles dedicated to specific hikes. 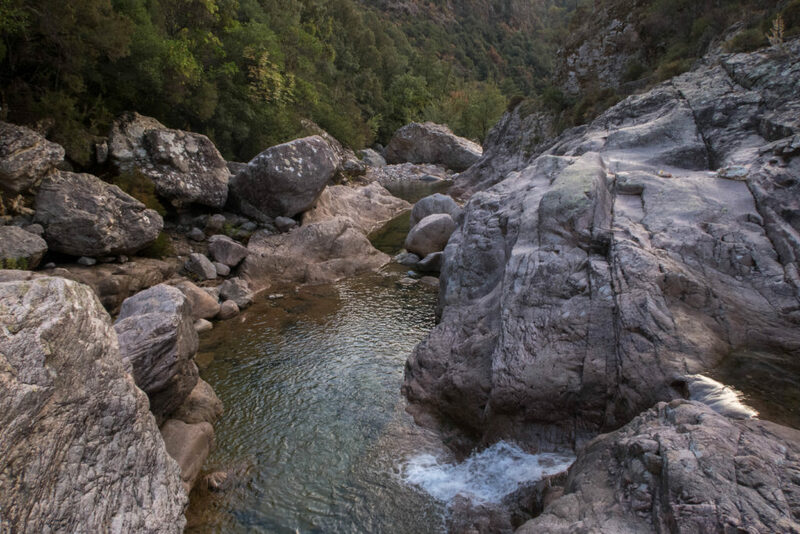 The travel and lifestyle blog a of (former) Corsican couple Du Talon Au Crampon [FR] counts several articles with beautiful and inspirational pictures dedicated to a specific town or region. Their articles about Ajaccio, Le Sentier des Douaniers (in the northern part of the island) or l’Ile Rousse are particularly interesting. Informative and beautiful articles were also published on Carnet d’Escapes [FR]. I particularly like the one about Piana and the Gulf of Porto..
Great post. I never knew Corsica had so much to offer. I stayed in the town once and it is truly beautiful. Can’t wait to go back now. Pinned! And yes, I was surprised as well, because I knew there were things to do, but I did not expect them to be so numerous! Also, the landscapes are very different if you are on the coastline or closer to the mountains. 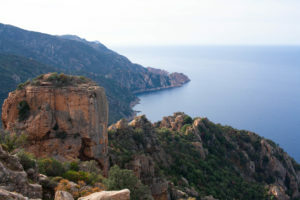 And even on the coastline, the earth was greyish with vegetation that looked like what you can encounter in the Scottish highlands at les Iles Sanguinaires, whereas there were big red rocks and Mediterranean vegetation around Piana! Really enjoyed reading this blog. 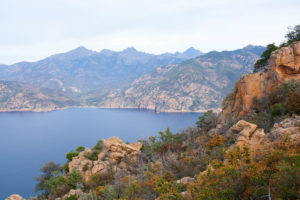 Would love to visit Corsica some day. Your blog surely gives some great information. Very well presented and the photos are great as well. I have never been to Corsica so now I have some insights thanks to this post. I am sorry that you had a friend who became car-sick with you, that definitely limited some of your plans. Looks like a good place for some day hikes and then relaxing in the evening at a nice local restaurant perhaps with a nice glass or wine or a beer. I think what limited us more was the fact that because of Day Light Saving Time, the sun went down around 5.30pm, so we did not have that much time to do a lot of things everyday. On the bright side, because we did not drive for hours, we could enjoy more bed-time hahaha! Corsica is one of those places that flies under the radar, for the most part. People who visit Mediterranean islands usually go for Sicily, Cyprus, etc. But you show that Corsica is worth the time and your pictures do a great job conveying its many appeals. 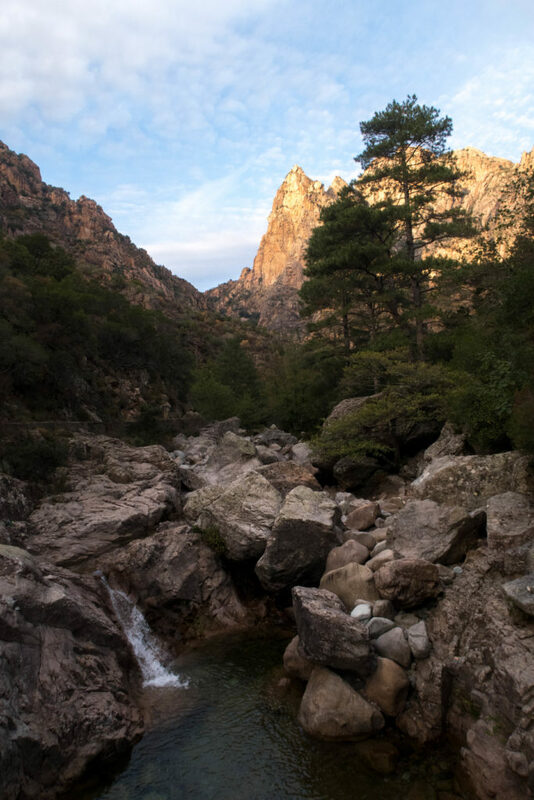 But clearly, if you have the opportunity to go to Corsica during the low-season, that’s a great place to visit! Loved how you structured your post . . So informative. The pictures are beautiful. It’s nice that you shared your learnings for your next trip as well. Until next time then. What a beautiful place. Going to wait for your next trip.